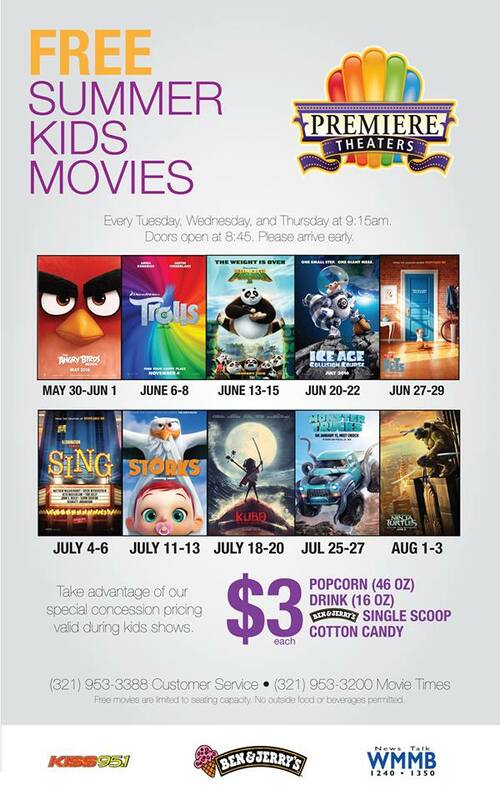 MELBOURNE, FLORIDA -- Premiere Theatres Oaks 10 is offering Free Summer Kids Movies on Tuesdays, Wednesdays, and Thursdays in Melbourne, Florida. For rainy days or really hot days, a free movie or two is a great activity for kids (and adults) of all ages. The Free Summer Kids Movies will feature a free kids movie each Tuesday, Wednesday, and Thursday starting at 9:15 a.m. A different movie will be shown each week and all are rated G or PG. The Movies feature a special concession pricing of $3 for popcorn, soft drinks, cotton candy, or a single scoop of Ben and Jerry's ice cream. Doors open at 8:45 a.m. Premiere Theatres is located at 1800 West Hibiscus Boulevard in Melbourne, Florida.